Celebrating their 22nd year, the Occidental Children’s Theater presents Dracula and the Beanstalk, conceived by Jamie Angell and directed by Tristan Waldron ’12. Featuring: Doyin Domingo ’17 (in green shirt), Greg Feiner ’18 (in yellow shirt), Dyoni Isom ’19 (in purple shirt), Jonathan Padron ’14 (in red shirt), Billy Schmidt ’17 (in blue shirt), and Amanda Wagner ’16 (in orange shirt). Performances are in the Remsen Bird Hillside Theater. 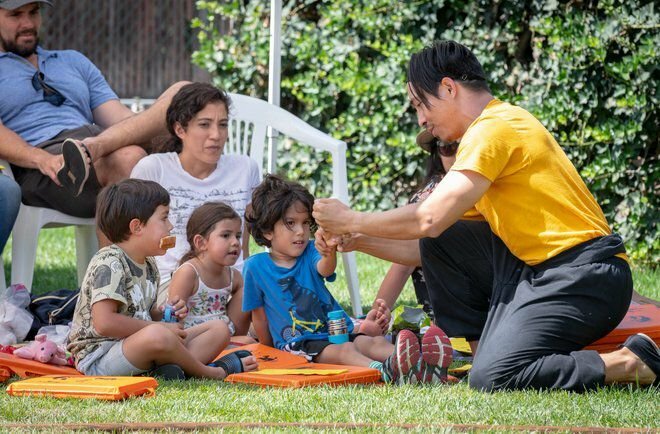 Eagle Rock — Most adults don’t think of children’s theater as entertainment that would have any appeal for them. 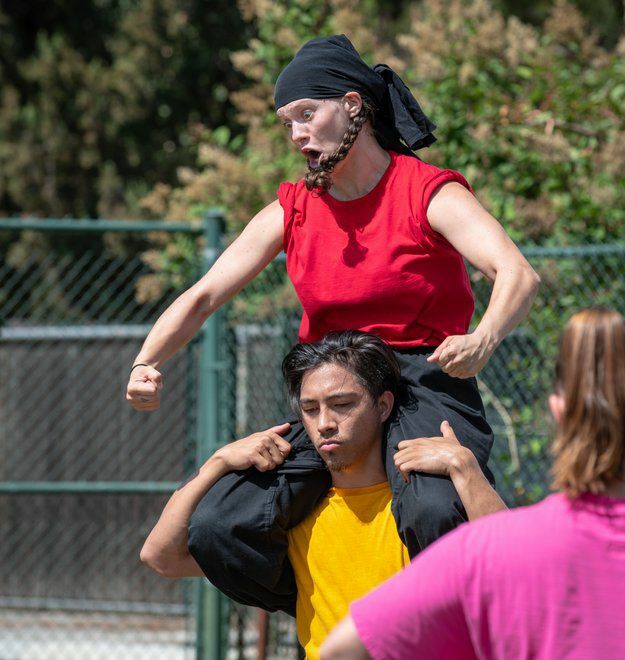 Yet the playful Occidental Children’s Theater ensemble performs with impressive acrobatics intertwined with hilarious characters, which grab anyone’s attention. That’s the goal for the founding artistic director, James Angell, who pens all of the scripts. “I wanted to write it in the tenor of Rocky and Bullwinkle. Children follow the actions, and the jokes are for adults,” said Angell. This year, they’re performing Dr. Scooby-Doolittle — a mash-up of two popular characters, Scooby-Doo and Doctor Dolittle — along with three adaptations of traditional folktales from various countries. The productions are held outdoors on a grassy space at Remsen Bird Hillside Theater on the college’s Eagle Rock campus. The ensemble consists of six actors who are either current students or alumni. The actors train for two weeks with movement coach Nick Erickson who comes in from Louisiana State University. Preparation involves strengthening exercises with weights to keep them in top physical shape for the 30 summer performances. Occidental Children’s Theater has been running for 23 years, and it took some time to streamline the process. The format is always the same: three folktales followed by the troupe’s story makeover. In addition to the show, the ensemble goes on three outreach tours to local recreations centers and teaches at acting camps at area elementary schools. “It took around ten years to figure out how to get all the parts together,” said Angell. Laura Castle, 38, has been going to the Occidental Children’s Theater for the last seven years. She takes her 5-year-old son and 3-year-old daughter. An actor herself, she learned about the theater after participating in a show at the college. All shows start at 10 a.m. on Thursday, Friday and Saturday through August 18.